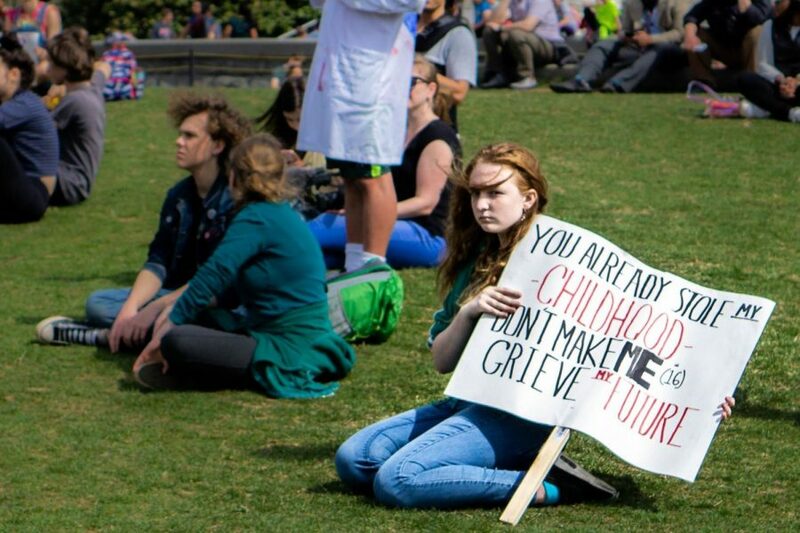 A student sits on the Capitol lawn during the March 15 climate change walkout. Students around the world walked out of class to demand action on the issue. Last year, current sophomore Serena Moscarella took interest in environmental conservation after writing an essay for her English class. 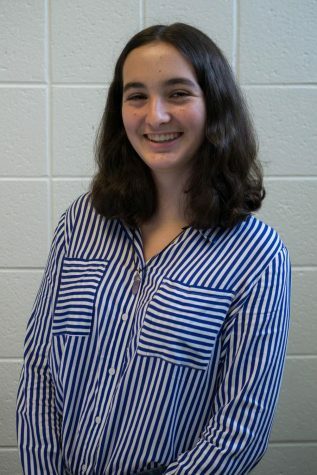 This year, she helped lead around 2,000 D.C. area students to the Capitol as part of a worldwide student walkout demanding climate change legislation on March 15. 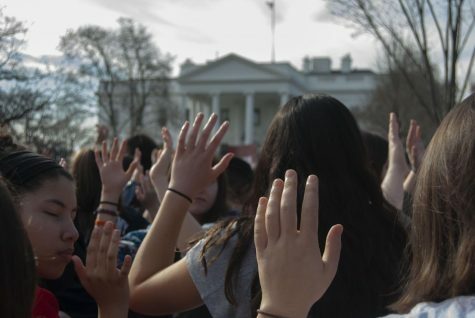 Around 30 Whitman students participated in the climate strike; numbers were likely lower than they could’ve been because of the widely attended walkout for gun control the day before. Students gathered in front of the Capitol after marching through the streets of D.C., where they chanted, held up climate change related posters and listened to walkout leaders speak. Multiple news stations televised the event. According to an official report released by the UN Intergovernmental Panel on Climate Change, there are just 12 years left before the most catastrophic effects of climate change become irreversible—one of the many reasons why students such as Moscarella chose to become more involved with the strike. Freshman Alissa Weisman joined the walkout after seeing a post about it on social media. Weisman had previously volunteered for Zero Hour, a youth-led organization that headed both local and national climate change protests last summer. Weisman helped promote the March strike on social media and recruited others to help with setting up the day of the event. The strike specifically supported the Green New Deal, a set of programs co-authored by Representative Alexandria Ocasio-Cortez (D-NY) and Senator Ed Markey (D-MA). The Green New Deal is a multi-step resolution to tackle climate change issues; it would require the United States to become carbon neutral by 2030 and create millions of jobs for Americans by upgrading efficiency and sustainability for national infrastructure and private businesses. 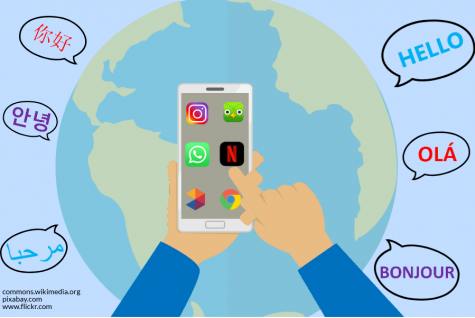 The bill was voted down by the Senate Mar. 26. Ocasio-Cortez said she still plans to keep fighting, drafting smaller but related bills. The Mother Earth Project, an organization that allows kids from all over the world to present artwork related to climate change, displayed art pieces as large as 30 feet at the strike, Moscarella said. Students also had the opportunity to sign a parachute that was lifted into the air during the speeches. Freshman Karla Stephan, who also helped organize the walkout, believes that being a part of the movement has already made an impact on her life. When compared to other places in the world, like Antarctica, India or China, the effects of climate change in the U.S. may not seem nearly as disastrous, Weisman said. But the U.S. will be severely affected by the continuous increase of greenhouse gas emissions. Western states are at risk of even more wildfires and the midwest may experience slowed agricultural production due to drought and flooding damaging many coastal cities, the Fourth National Climate Assessment reported in November 2018. This same report predicted the U.S. economy will shrink by as much as 10 percent if climate change continues at this rate.